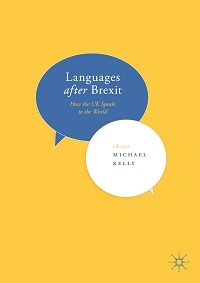 As negotiations to leave the European Union continue to dominate the news headlines, a new book which provides a comprehensive and detailed analysis of the situation for languages in the UK post-Brexit has just been published. Described by Professor Naomi Segal of Birkbeck, University of London, as ‘timely and urgent’, Languages after Brexit is a collection of essays by prominent experts in various language-related fields. The collection includes chapters on translation and interpreting, community-based language teaching, and the increasing value of language and culture to business in post-Brexit Britain. CIOL (the Chartered Institute of Linguists) has reported on the progress of Brexit from shortly before the referendum was held, seeking the views of its members, to the present, with articles in the membership magazine The Linguist, and on the website. We are delighted that many of the contributors to the volume have connections to CIOL, including the renowned linguist David Crystal HonFCIL and CIOL Vice-President; Campaign Director of Speak to the Future Bernardette Holmes; CIOL Vice-President Tim Connell FCIL; CIOL Chief Executive Ann Carlisle; and Director of Cambridge University’s Language Centre Jocelyn Wyburd. Languages after Brexit will appeal not only to students and scholars of this subject, but also to practitioners, policy makers and educators.